DIMENSIONS: (19W x 20L x 15H) This licensed Toy Story 3 5-in-1 bouncy castle is the largest in a line of Toy Story inflatable products from Ninja Jump. The draw of the smash hit Toy Story 3 is sure to add to your next event, for bouncy castle fun all day long! The fantastic artwork panels feature all of the favorite Toy Story 3 characters, including Woody and Buzz Lightyear, Hamm, Jessie, along with Mr. and Mrs. Potatohead. The fantastic slide arch features newcomers from Bonnie's toybox, like Trixie the Triceratops and Buttercup the unicorn. 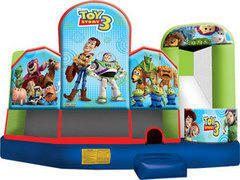 Participants can choose from five different exercises in this well-equipped, licensed Toy Story 3 bouncy castle. The 5-in-1 combo style jumper is the ultimate in inflatable bounce houses! The roomy interior jumping area offers a basketball hoop along with log and pop-up obstacles. This bounce house has a climb feature and a convenient exit slide for hours of active fun! Parents and spectators are offered a clear view with the 360-degree mesh sides of this moonwalk. The 5-in-1 combo bouncy house is made of lite n strong™ fire-resistant vinyl for safety, durability and easy portability. This 5-in-1 bouncy castle is sure to make any indoor or outdoor event a great success!